"How should I ‘dress’ a three door window?" I need your window treatment ideas please as I have a three door unit that leads from my living room to the deck and pool area and I don't know what to do with it. Only one of the doors, the one on the right actually opens. I really need some kind of window treatment here but don’t want to go the boring route of simple, individual curtains on each door. It is a really big room and I think it needs something dramatic but I just can’t think what to do. I really want an idea that would help me make a statement. Traditional yet making a statement? Window treatment ideas for dramatic effect? I must say my first thought was the theatre. 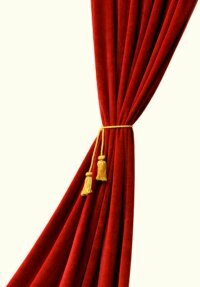 Perhaps it is just because I am English but I can imagine a sweeping deep red velvet curtain just like we have in the West End Theatres of London (I am not sure if it is the same in US). I suggest you consider using just one fabulous, full, heavy curtain. Depending on the colour scheme of your room rich red velvet edged in gold would be great. Let the over-long fabric 'pool' on the floor for a luxurious look. Hang the curtain from a big ‘chunky’ gold pole with the curtain pulled back to one side (the non-opening side of course!) with a large gold tasselled tie back. Gold tasselled edging on the curtain would be great too and add to the dramatic effect. Make sure that the pole is long enough for the curtain to be pulled right back off the window so that it is only covering the wall so you can let the sun flood in on a nice day. Thank you for your time involved and effort and the valuable information you have provided me. I appreciate all that you have done. Need a second opinion before you start a project? Just send it in to us and we will do our best to help. Your question will appear on a Web page exactly the way you enter it here. You can wrap a word in square brackets to make it appear bold. For example [my story] would show as my story on the Web page containing your question. What Color Curtains Would Go In My Mexican Living Room?